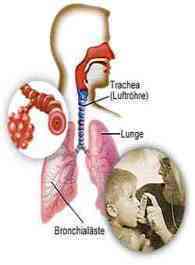 There are many types of lung disease and respiratory disease and also many potentially toxic chemicals and toxic substances which have shown evidence of playing a part in the development of these diseases in Humans. The chart below lists many of these respiratory and lung diseases and links to lists of toxic chemicals and substances which have a likely causal link. Conclusive causal relationships are difficult to establish because chemical exposure is variably manefest in lung disease or respiratory disease symptoms based on many interconnected physical, environmental, and genetic factors which are hard to quantify, predict, or define. Some examples, are genetic makeup, quantity of dose exposure, duration of exposure, route of exposure, concurrent or previous exposures to other chemicals (such as from cigarette smoke), age, and lifestyle factors like diet, level of activity, alcohol consumption, smoking, or UV exposure. Since the Industrial Revolution over 100,000 additional industrial and household chemicals have been manufactured, distributed, used, and dispersed into our environment. Detectable amounts of many of these chemicals now exists in the air, water, food, and consequently OUR BLOOD! However, less than 6% of all chemicals have been tested for toxic health effects. Consequently, many of us are being exposed to multiple toxic chemical contaminants on a daily basis yet have little understanding of the dangers of those exposures such as from the above listed lung diseases or respiratory diseases. While we do not understand the potential toxic effects of most chemicals by themselves, worse yet is our understanding of how different chemicals may interact to affect our health. The chemical cocktails we take into our bodies may have opposing, additive, or synergistic health affects. For example, someone who was exposed to Asbestos Fibers or high levels of Radon and also smokes cigarettes can be up to 25 times more likely to develop lung cancer. This risk is far greater than the sum of the individual chemicals' health risks. This is probably because cancer is a two step process of initiation of genetic damage and promotion of cell division incorporating that genetic damage into new cells before that damage can be repaired. The cigarette smoke damages the lungs cells and genetic contents while the asbestos lodged inside the lungs continuously stimulate the immune system and cell division in an attempt to repair and remove the fixed particles. The end result is uncontrolled cancerous cell division or lung disease. Klaassen CD, Ed. Casarett and Doull's Toxicology: The Basic Science of Poisons, 6th edition. (2001) McGraw-Hill publishing, New York. LaDou J. Ed. Occupational and Environmental Medicine, 3rd edition (2004), Lange Medical/McGraw-Hill, New York. Rom WM, Ed. Environmental and Occupational Medicine, 3rd edition (1998). Lippincott-Raven, Philadelphia, PA.
indicates a clear causal link with the lung disease or respiratory disease has been verified by the medical community. Also included in this category are Group 1 human carcinogens as defined by the International Agency for Research on Cancer (IARC). These chemicals are known to cause cancer is humans based on substantial evidence. indicates some evidence of human health effects through epideological studies and strong corroborating evidence via animal studies (IARC Group 2A chemicals). indicates limited or conflicting evidence of association with lung disease or respiratory disease in humans based on only a few case reports of exposed individuals, non-conclusive epidemeological studies, and animal toxicity. IARC Group 2B chemicals and EPA Group B2 chemicals which show limited or inadequate evidence of animal or human carcinogenicity.